This makes me so happy to read. Thanks, Jay for meeting and helping another ’67 owner! Congrats, Jessica and Charlie. -ES. Jessica informed me that she and Charlie had acquired a 1967 Beetle which needed a few things, including the aforementioned speedometer. Then, Jessica said something really funny! She said…..”She’s suffering an identity crisis!” I began to laugh—it was hilarious. 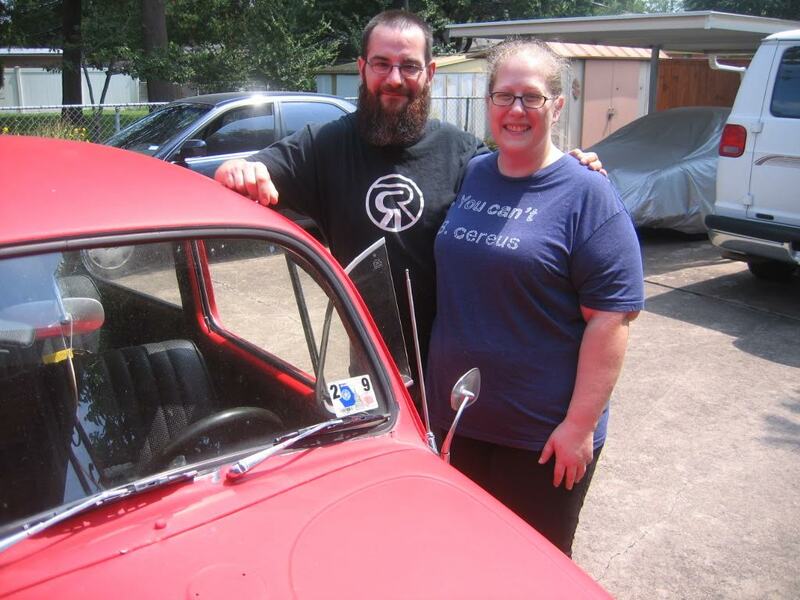 After I calmed, Jessica told me that “she” is “Gertrude” her newly purchased ’67 Bug. We talked a bit about naming Beetles—which thing is what my Neva is good about doing. And—laughed some more! In order to get to the bottom of the matter, we discussed the other Factory VIN, beneath the rear bench seat. I told Jessica that both Auto VINs should agree and that they certainly should match the Title VIN. When Charlie and Jessica visited this morning, the first thing which Charlie and I did was to remove the rear seat and clean and chalk the Chassis VIN. Sure enough, it agreed with the Aluminum Tag VIN behind the spare tire. 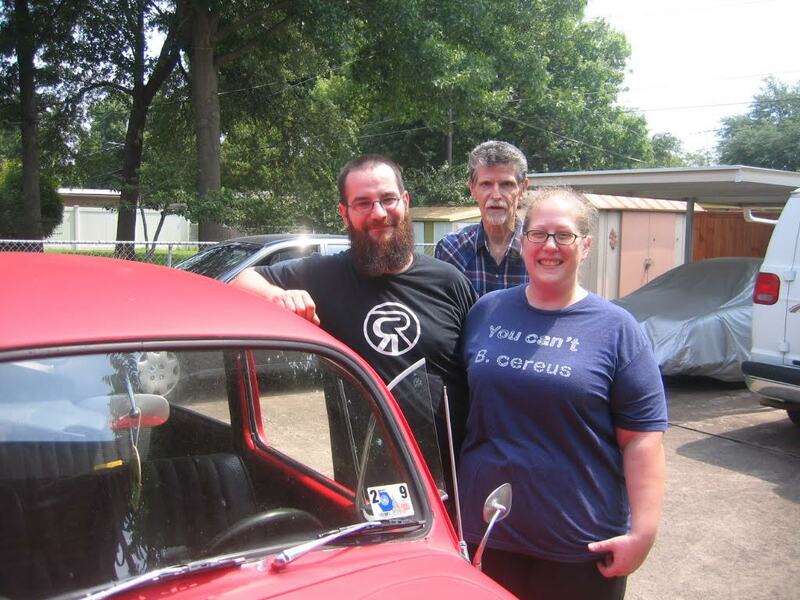 Both gave proof that the car is, indeed, a 1967 Beetle Sedan. Overnight, after our Friday conversation by phone, Jessica also had done some study of VINs on thesamba.com and had an idea of the Manufacture Date of the vehicle, assuming that it was a ’67 Bug. In fact, Jessica continued to amaze me with facts which she had been learning during her study about her Gertrude! She had been reading every article that she could from 1967beetle.com. Hey—that’s what the Site is there for, isn’t it! And, it is doing its work. Our daughter, Janeva, came from her home across the street. Gus—their Dachshund, tagged along, greeting each of us in turn. Janeva grew up in VWs, helped with various mechanical repairs as a child, learned to drive them and did drive them—even through college and afterwards. She has a great eye for judging VWs! She learned the Craft well from “someone”! We talked about motor oils, tires, new rubber seals, carburetion, auto insurance and, yes…that needed speedometer. Jessica ended up walking away with a 3/67 Date Stamped unit. Later in the afternoon, she told me that the speedometer had been installed and was behaving splendidly. That’s what we love to hear, isn’t it! We also talked about qualified VW mechanics in the area in which we live. Qualified VW shops and mechanics are in short supply, but both Charlie and Jessica are not afraid to tackle maintenance situations. Jessica already changes Gertrude’s motor oil and has done some carburetor work. And they both worked to install the newly acquired speedometer. After almost 3 hours, we parted ways, promising to get together again. 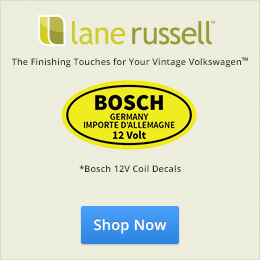 Even planning to caravan to a large VW show in North Central Texas the first part of July. And that, My 1967 Beetle Friends, was how Neva and I, Janeva and Jessica and Charlie spent several hours of our Saturday! Next: Next post: Fuel Pump To Carburetor — Am I Safe? Thanks so much to you and yours, Jay! One of the best afternoons to recent memory! As I talked about, I remember when I owned my first beetle twenty years ago how wonderful the community can be. Neva, Janeva, and you embody the welcoming and familial feelings I associate with VW owners. I look forward to getting to know all of you and my sweet Gertrude better in the years to come! And a huge thanks to Eric for providing this site as a platform for learning and sharing. 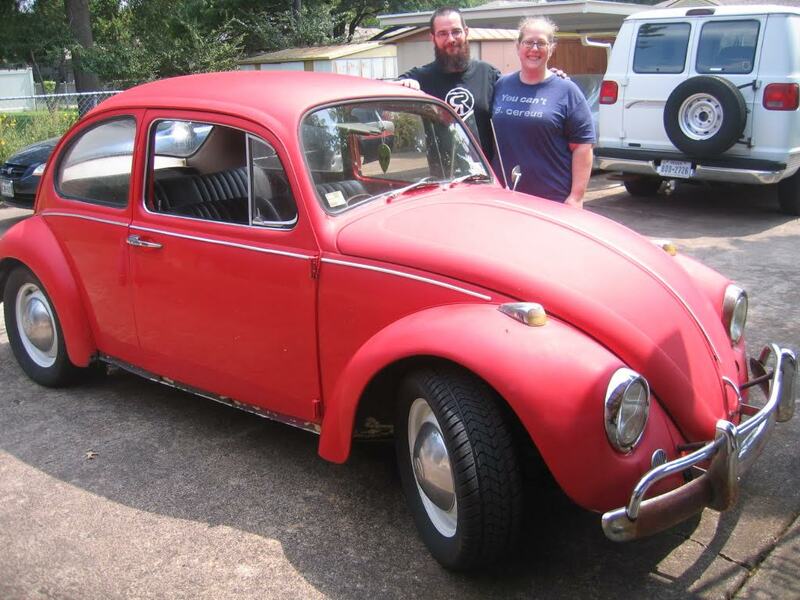 There’s just nothing better than a little ’67 VW Beetle, and checking out the new family baby. Jay, Neva, Janeva and Gus, reading this made me feel like I was there! I could even picture Gus sauntering across the street! Charlie and Jessica your adventure has just begun, but with Jay as your wingman “Gertrude” will rise again! Well, as I am.. And have bin Bettle poor this past 2 years, I still very much LOVE the story’s of others finding there gold. Nothing beats the learning of its history, and the dream of where it may take you. The smell of a new project is even a great thing. Well, depending where it’s lived the past few years I guess… But you get it right ? Exciting possibilitys. Congrats on the newest member of your family ! I’m sure Jay will get you headed down the right roads in no time. Thank you, Richard! Jay is so knowledgeable! Charlie and I are so happy to have met such a wonderful couple! We have found we share common interests beyond buggies. I’m sure you’ll find another again! It was 20 years between my first and Gerdy. Oh yes…I have bin keeping my eyes open, and I know exactly what I’m looking for ! Last while iv bin expanding my garage, and adding a few beetle friendly tools to the collection for when the next one shows its self…lol. And, although never meeting Jay face to face, we keep in touch often, and I find MANY things of interest between us ! I usually learn something as well. The beetles we have had, has bin the beginning of a few still going friendships, and a few simply excellent people just meeting in passing as well. The beetle just tells others your a friendly people I’m sure.